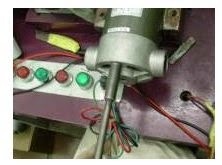 - If there is noise and sparks, there you may need to change the brushes of the motor. See the following pictures on how to work to replace the brushes. - Loosen the motor cover bolts and remove it lightly from the seat but without removing the lid completely. Try rotating it in reverse and tighten the bolts again.